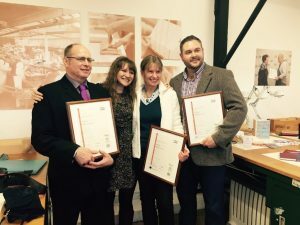 Three veterans were awarded the top City & Gu ilds certificate in bookbinding last Friday at a ceremony in the Daffodil Barn workshop near Pewsey. Presentations were made by the Master, The Worshipful Company of Stationers and Newspaper Makers to Wendy Lagden, Kenny Teasdale and Nick Simmons, who had each completed the City & Guilds syllabus over the last 18 months. Helen Esmonde, the Stationers’ Comany Master, praised the veterans for achieving these certificates despite the significant difficulties caused by their wounds, injuries and illnesses. They successful students are pictured here with the charity’s Principal Instructor, Freya Scott. One of our veterans, who has recently qualified for a City & Guilds award in bookbinding, was presented with his certificate yesterday by Her Royal Highness the Princess Royal.